This will be short and sweet ... I still have a bunch of things to do before tomorrow morning. But, I do have the cookies baked, 3 little lunches made, 3 little outfits laid out, and three little sweethearts sound asleep (at least, I hope so). Mommy jobs are all done; some teacher jobs still to go. I've got my room all set up, though. Just wanted to give you a quick picture tour. First up - my classroom reading wall / library. Hands down - my favourite spot in my classroom. I have my books organized by genre / author in cubbies instead of baskets. I prefer the cubbies because students can easily see the titles of all the books. My desk area (still have a bit of tidying and organizing to do here). The table behind my desk has my document camera and laptop. I made a new bulletin board to cover some of my older blackboards - pretty proud of it. 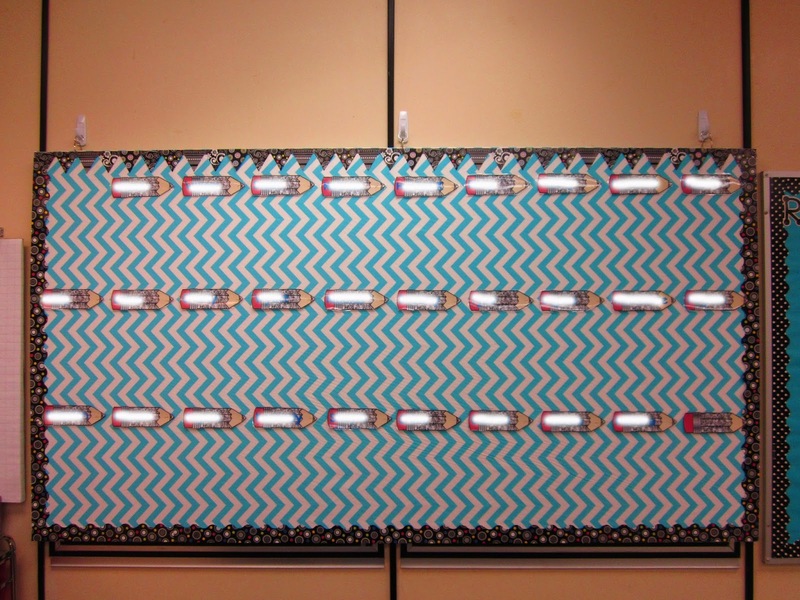 :) I covered a 4 x 8 sheet of styrofoam insulation in this fabulous chevron fabric, and then hung it from binder rings on 3M hooks. This is my writing bulletin board I use to display all our writing from the year - the little silver pencils have the students' names written on them. You have a fantastic room. It is also so big. I'm jealous.. Good luck on your first day. oh Jen, I can't even begin to tell you how much I love your classroom!!! I just want to grab a book from your gorgeous library and take a seat on that awesome chair (or that rug! It is perfect!!). Everything is so bright and comforting at the same time. Do you think I could come up and visit you? Then I could see all the loveliness in person PLUS get to chat with you :) Best of luck tomorrow, though I know you won't need it! Love your room! Enjoy your first day! Love your library! Was that a custom bookshelf? Awesome room! Have fun tomorrow!! Jen: Your room looks beautiful... I am wishing you a WONDERFUL first day of school tomorrow. I will be thinking of you when I start my day! Your room is beautiful, yet very functional! I love the library cubbies instead of baskets! That button rug is to DIE FOR!! I adore it! :) Your room looks awesome- colorful and organized...just the way I like it ;) I'm happy to see that your door poster held up well enough for another year of display! Thanks for the tour! Your room is absolutely beautiful, Jen! Your students are going to have no excuse for learning at their absolute best with a great classroom and a fantastic teacher! Have a wonderful year. Did you buy those cubbies or did they come with your room? What a colourful and inviting room! It's awesome! I wish we were still able to hang objects from our ceilings! It adds interest for sure! I love your classroom. It's so bright and colorful. Your button rug is so cute! I hope you had a great first day. Tomorrow is my first day with the kiddos. Was your fire department worried about the styrofoam? Styrofoam has a nasty and toxic smoke if it burns (heaven forbid!!) . I had to use a cut up freezer box. I hope you had a great first day, your classroom looks amazing!